1. 【ADJUSTABLE MAGIC STICKER 】: Our Sauna waist belt use Widen Magic Sticker design allowing you to adjust the size to fit even you have lose weight after a few weeks later. 2. 【NEW RELEASE】: Our Sauna waist belt can slim waist tummy and tights, provides instant abdominal compression and lumbar support, hides belly bulge, helps in burning tummy fat , reducing your abdomen and waist,and it gets sweat easily. 3. 【PREMIUM MATERIAL】: Our Sauna waist belt is made by 70% Neoprene, 15% Polyester and 15% Nylon. Heat up your core body area and then burn excess calories in your body by retaining body heat. Promote weight loss by preserving body heat and stimulating sweat during exercise without any discomfort. 4. 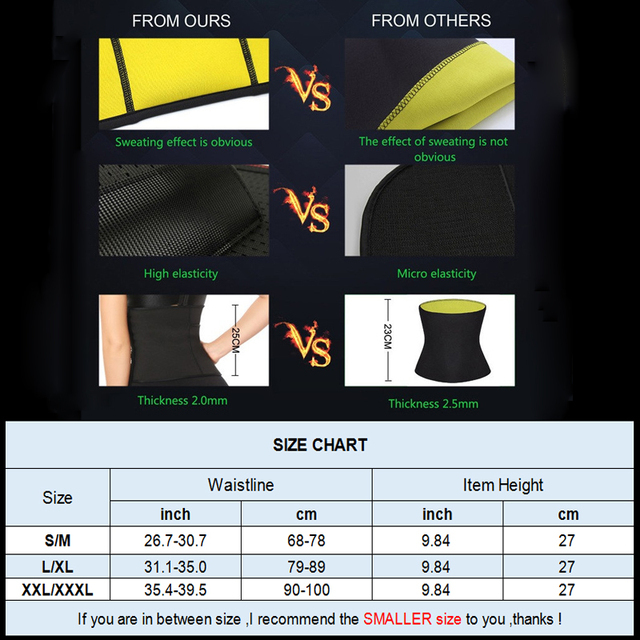 【RAPIDLY IMPROVES YOUR BODY SHAPE】: Our Sauna waist belt Made of quality neoprene which is lightweight, comfortable and offers great performance on burn your fat and shape your body; The well made special neoprene waist trainer Increased sweating and flatten abdomen to body shaper and sliming.Suitable for for yoga, gym, fitness, running, cycling and much more sports. 5. 【SWEAT 3 TIMES MORE THAN USUAL】: Our Neoprene Sauna waist belt preserves body heat and stimulates sweat during exercise. Our Neoprene Waist Trainer can make you sweat 3 times more like never before and help to flatten your tummy, Lose inches and melt the fat away! 6. 【Kindly Attention】: You may smell Our Sauna waist belt like a rubber when you first use.But that is normal.Because this Sauna waist ab trimmer band is made of real neoprene.We suggest that you’d better softly hand wash the sport corset wrap with cool water and let it air out before use.The smell will be gone. 1 piece neoprene waist belt .If you have any requirements ,such as color or size problems ,please contact us first ,we will try to accommodate you ,thanks !!! if you are in between size ,I recommend the SMALLER size to you ,thanks ! Qualidade extra e transporte muito rápido. best store. EU VOU comprar só nesta loja. EU lhe desejo boa saúde e muito trabalho no Ano Novo. obrigado.